LANSING, Mich. -- Michigan Gov. Rick Snyder asked President Barack Obama on Wednesday to reconsider his denial of a federal disaster declaration to address the drinking water crisis in Flint, saying its severity poses an "imminent and long-term threat" to residents. Obama: Handling of Flint water crisis "inexcusable"
Mr. Obama declared an emergency -- qualifying the city for $5 million -- but determined it is not a disaster based on the legal requirement that such additional relief is intended for natural events, fires, floods or explosions. 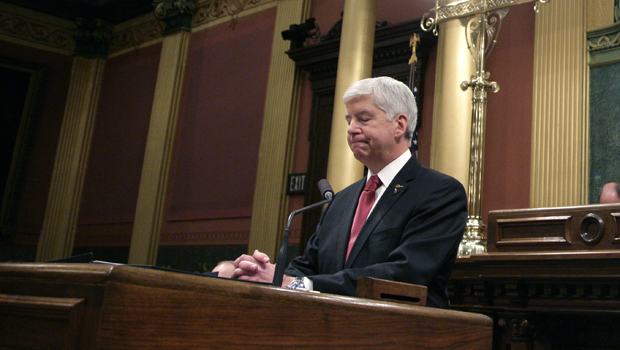 Snyder had estimated a need for up to $95 million over a year. On Wednesday, Mr. Obama was in Michigan. He addressed the Flint water crisis during a speech. "I know if I was a parent there I would be beside myself about health of kids," the president said. "That's why I sent resources and declared emergency declaration." Mr. Obama said that on Tuesday he met with the Flint, Michigan, mayor at the White House. "I told her we would have her back and all the people of Flint, as they work through this terrible tragedy," the president said. In his appeal letter -- sent the same day Mr. Obama was in Detroit for the North American International Auto Show -- Snyder called the decision a "narrow reading" and likened the crisis to a flood, "given that qualities within the water, over a long term, flood and damaged the city's infrastructure in ways that were not immediately or easily detectable. This disaster is a natural catastrophe in the sense that lead contamination into water is a natural process." He said the state and city cannot meet all the needs of Flint residents. He again painted a bleak picture of the city and said the "economic injury" from the crisis is significant. Snyder said the disaster will lead to years, potentially decades of health problems and economic losses as well as infrastructure repairs that "neither the city, county or state have the capacity to conduct." The second-term Republican, who devoted his annual State of the State speech Tuesday night to the emergency in Flint, planned Wednesday to release his own emails regarding Flint's water, which became contaminated with too much lead when the city switched its water source in 2014 as a cost-cutting measure while under state financial management. On Wednesday afternoon, Snyder's administration released more than 270 pages of his emails related to the Flint water crisis. The emails were posted Wednesday on his website, www.michigan.gov/snyder. Though not everyone was pleased with how the emails were presented. "I'm sorry most of all that I let you down," Snyder, whose administration is engulfed in criticism, said in address, as hundreds of protesters demonstrated outside the Capitol. "You deserve better. You deserve accountability. You deserve to know that the buck stops here with me. Most of all, you deserve to know the truth, and I have a responsibility to tell the truth." Just spoke with Michigan Gov. Rick Snyder about the Flint water crisis and teacher sick-outs in Detroit for tonight's @CBSEveningNews. The lead-- which can lead to behavior problems and learning disabilities in children and kidney ailments in adults -- has left Flint residents unable to drink unfiltered tap water. The National Guard, state employees, local authorities and volunteers have been distributing lead tests, filters and bottled water. Snyder aides pledged that by the end of the week officials would visit every household in Flint to ensure they have water filters. Democrats said Snyder only recently admitted the magnitude of the fiasco, at least three months too late. "This is the kind of disaster, the kind of failure to deliver basic services that hurts people's trust in government," House Minority Leader Tim Greimel said. All the political back and forth is not helping Flint resident Abbey Carradine with her new normal: worrying about water. On Wednesday, she bottled tap water for lead testing. The State Department said she may not know the results for weeks. "Everyday I wake up and we have been going to different places to shower," she told CBS News' Adriana Diaz. "And this is our life that we live every day, its just been turned upside down." By they -- she means officials including Gov. Snyder. Flint Mayor Karen Weaver refused to call for Snyder's resignation while at the U.S. Conference of Mayors meeting in Washington, D.C., saying investigations should go forward. She said she wants Snyder to give Flint "the services and the money, the funds that we need to address the population." In his speech, Snyder committed $28 million more in the short term to pay for more filters, bottled water, school nurses, intervention specialists, testing and monitoring -- on top of $10.6 million allocated in the fall. The money also would replace plumbing fixtures in schools with lead problems and could help Flint with unpaid water bills. The new round of funding, which requires approval from the GOP-led Legislature, is intended as another short-range step while Snyder works to get a better handle on the long-range costs. A House committee on Wednesday swiftly approved the spending bill, which could reach his desk next week after more legislative voting. He plans to make a bigger request in his February budget proposal. "To you, the people of Flint, I say tonight as I have before: I am sorry, and I will fix it," he said. Snyder, a former venture capitalist and computer executive who took office in 2011 billing himself as a practical decision-maker and a "tough nerd," has rejected calls for his resignation. He has previously apologized for regulatory failures and for an underwhelming initial response and on Tuesday outlined a timeline of the "catastrophe" dating to 2013, and blamed it on failures at the federal, state and local level. Michigan's top environmental regulator Dan Wyant resigned over the failure to ensure that the Flint River water was properly treated to keep lead from pipes from leaching into the water. Elevated blood-lead levels were found in two city zip codes. The Rev. Jesse Jackson, who attended the address, said Snyder's contrition "does not mitigate the crime that has been committed." But Republican Senate Majority Leader Arlan Meekhof said Snyder is a "real leader who took responsibility even though he did not cause the situation." The U.S. Justice Department is helping the Environmental Protection Agency to investigate, and GOP state Attorney General Bill Schuette has opened his own probe, which could focus on whether environmental laws were broken or if there was official misconduct. The EPA is under scrutiny for its role, too.